Rod Taylor plays Ralph Halloran -- a sensible, bespectacled schoolteacher -- in this low-key family drama with high-caliber talent on and off screen. "The Catered Affair" was directed by Richard Brooks and produced by Sam Zimbalist. The cast was led by Bette Davis, Ernest Borgnine, Debbie Reynolds and Barry Fitzgerald. Gore Vidal did the screenplay, adapting a television play by Paddy Chayefsky. Rod Taylor earned his role in this ensemble based on the strength of a screen test for the Rocky Graziano story, "Somebody Up There Likes Me." Although Paul Newman got that part, Taylor landed a contract with MGM, and the accent he put on for the screen test earned him the role as a schoolteacher from the Bronx in "The Catered Affair." His accent was so convincing, Rod said that the new MGM chief, Dore Schary, "didn't know I was just 18 months out of Australia until the movie was half finished." "The Catered Affair" is a kitchen-sink drama, depicting the lives of working class families. The movie followed quickly on the success and acclaim of "Marty" (1955), which had been written by Chayefsky and won Oscars for best picture and best actor (Borgnine). 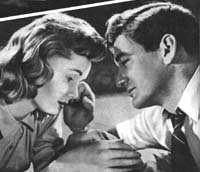 The acclaim for "The Catered Affair" was not on a par with "Marty," but it did earn Debbie Reynolds a best supporting actress award from National Board of Review. As the film opens, Jane Hurley (Debbie Reynolds) announces at breakfast that, after three years of courtship, she and her fiancé Ralph are getting married in a week. She says they just want a small wedding with the immediate family and no reception. Jane's parents react matter-of-factly and everyone seems to be in agreement about the practicality of the arrangement. But when the future in-laws gather for dinner that evening, all Ralph's parents talk about are the big weddings they gave their daughters. All of a sudden, Jane's mother (Bette Davis) is planning a big wedding breakfast with hundreds of guests. As the cost of the catered affair begins to exceed the family's savings, Mrs. Hurley rails at Mr. Hurley (Ernest Borgnine) for failing to be a good provider. But Mr. Hurley has been saving money to buy his own taxicab, and on the verge of realizing that dream, he sees all his money going toward a wedding neither Jane nor Ralph really want. The wedding is clearly compensation for Mrs. Hurley's own hurried, unromantic nuptials as well as her general emotional disregard for her daughter as she grew up. It's her chance to give her daughter something to think of "when the bad years come." As a counterpoint to the indifference and awkwardness in the Hurley household, it's clear that Jane and Ralph won't have any bad years. In one scene together, Taylor and Reynolds show us a couple comfortable with each other and with a sweet passion that's sure to endure. He acts the way he is. His principal asset, as an actor and a person, is the fact that he listens well to a director and other players. His actions are all normal to the scene and honest, particularly in a role which will permit him to exploit his own personality. I predict that Rod Taylor will go straight to the top. But Brooks wasn't always so kind. "I didn't know it at the time, but Brooks ate and digested actors for breakfast," Ernest Borgnine is quoted as saying in "Tough as Nails: The Life and Films of Richard Brooks" by Douglass K. Daniels. "If things weren't working, he let you know it, and not gently." Case in point was Debbie Reynolds. Like Bette Davis, she played against type in "The Catered Affair." Unlike Davis, she did not have a long history of dramatic roles to give her credibility with her director. In her autobiography, "My Life," Reynolds said she felt like she was right for the role -- she could relate to the hardscrabble youth of her character. The studio wanted her for the role. But Brooks protested. He wanted someone very understated, not known, and not so cute. "He called me Miss Hollywood and Debbie Darling and Debbie Dimples," Reynolds wrote. "Maybe he thought I was going to play star." Reynolds describes how her costars helped her through scenes when Brooks was being cruel to her. She did give Brooks his due, however. "When it came to actual shooting, the director worked hard with me too," she wrote. "But he intimidated me throughout the production and I hated it." A handsome leading man and marvelous actor ... but I knew him as a terrific friend. Rod and I met in the early 1950s when we worked together on The Catered Affair. Making this movie was very difficult for me because the director, Richard Brooks, treated me like a child and made my life miserable. Because of the director's behavior, Bette Davis, Ernest Borgnine and Rod, who played my fiancé, all took care of me. They helped me with my scenes and treated me so well. I will never forget Rod's kindness as he and the others turned a difficult experience into a marvelous one. Rod and I spent many good years together while we were under contract at MGM. Debbie I adore... so much so that I by-passed Julie Andrews and voted for Debbie in the best-actress Oscar race this year. I still think she should have won it for "The Unsinkable Molly Brown." Video of scene between Rod Taylor and Debbie Reynolds: Chemistry! Apparently there's a colorized version of the film in Russia. 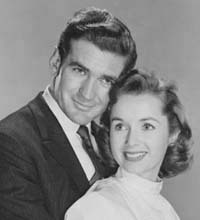 This promotional still of Rod Taylor and Debbie Reynolds makes for a good wedding portrait. It was adapted for use in Rod's 1998 film, "Welcome to Woop Woop." 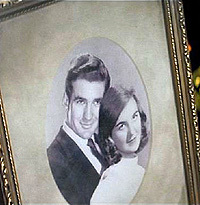 It was Photoshopped for that movie, replacing Debbie's image with the likeness of a young Maggie Kirkpatrick, the Australian actress who played Rod's wife.